JCB has decades of experience in manufacturing full-size and compact excavators. The company currently offers 12 compact excavator models, ranging from the 1.8-ton 18Z-1 to the 10-ton 100C-1. While the JCB lineup of compact excavators is deployed to a wide variety of construction applications, machines in the 1.8- to 4-ton range are commonly used in landscaping applications and are a popular choice for rental fleet managers. Machines in heavier weight classes are most popular for larger excavation, sewer and pipeline projects. According to JCB, its compact excavators provide operators and fleet managers with the advantages of some of the strongest, most versatile, easily maintained and safest machines on the market. JCB excavators feature heavy-duty, fully-welded H-frames for solid, rigid structures and a low center of gravity. Track components are sealed for life. JCB hydraulic systems boast the latest industry technology O-Ring Face Seal (ORFS) hydraulic fittings, providing good sealing capabilities. JCB’s programmable twin auxiliary lines provide high and optional low hydraulic flows to operate an array of attachments. The JCB range also offers excellent visibility due to large front, side and top glass areas, says the company. With the recent introduction of JCB’s 18Z-1, 45Z-1, 48Z-1 and 55Z-1 zero tail swing models, and the 19C-1 and 57C-1 conventional tail swing models, JCB says that it offers the machines and capabilities that its customers demand and is poised to grab a bigger share of a market expected to continue to grow in coming years. JCB says it has designed its compact excavator range to incorporate five key characteristics: comfort, controllability, reliability, serviceability and performance. The company notes that the 18Z-1, 19C-1 and 8029 compact excavator models provide precision control, great service access and an exceptional operator environment — all in a compact package that’s easy to transport and ideal for size-restricted jobsites. Meanwhile JCB’s 45Z-1, 48Z, 55Z, 85Z and 90Z zero tail swing compact excavators address the need for compact machines that are quick, powerful and productive. Easy-to-operate and control, a ZTS compact excavator bears serious consideration, particularly when it comes to stability and power. The 57C, 67C, 86C and 100C offer the same high performance with minimal tail swing. The JCB compact excavator range offers a multitude of machines that are useful across a whole host of applications and sites. For home building, construction, rental, engineering, rail construction and site preparation, mid-range models are easy to use and compact, with excellent visibility, power boost and lift capabilities. In addition, the company’s zero tail swing and best-in-class full-swing radius means less chance of damage to buildings, equipment and machines, greater visibility over the rear, effective working in confined spaces and the potential to work in a single lane of traffic for minimized disruption and cost. 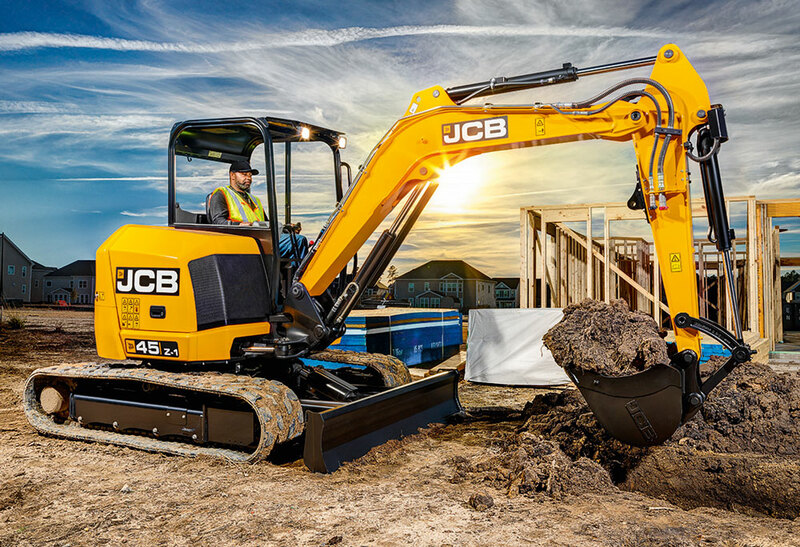 Learn more about JCB here.